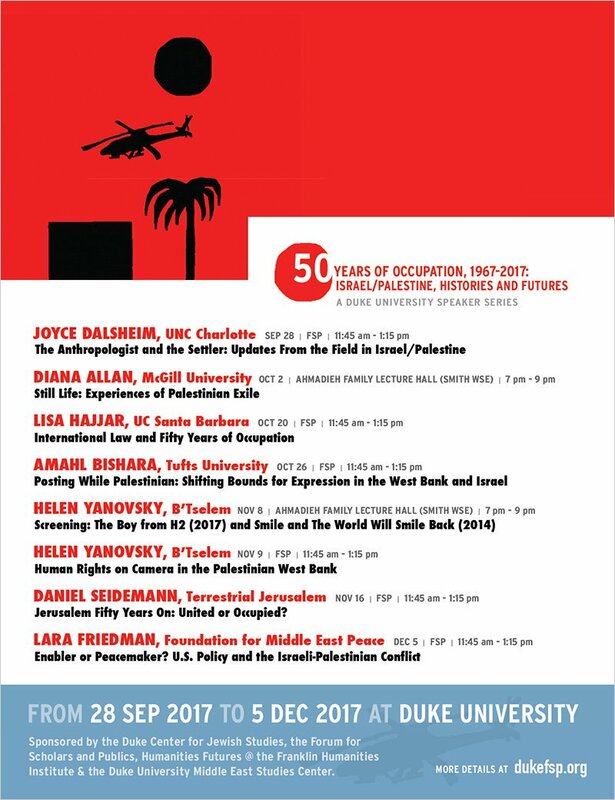 Over the course of the fall semester, seven scholars on Israel/Palestine spoke at Duke in a lecture series entitled "50 Years of Occupation, 1967-2017: Israel/Palestine, Histories and Futures." The speaker series included Amahl Bishara, who spoke about the use of the internet and social media in the West Bank, Joyce Dalsheim, who lectured on the anthropology of settlers in Hebron, and Lisa Hajjar, who discussed international law and the Occupation. Helen Yanovsky of the Israeli NGO B'tselem spoke about the organizations’ camera project, distributing cameras to Palestinians in the West Bank. The lecture series concluded as international attention turned to Jerusalem, amid announcements by the Trump administration that the U.S. Embassy will move from Tel Aviv to Jerusalem. Daniel Seidemann, the founder of Terrestrial Jerusalem, spoke about the geographic, religious, and political importance of Jerusalem to Muslims, Jews, and Christians. The Israel/Palestine speaker series, now an annual fixture at Duke, creates a vital space for students, faculty, and community members to engage with a wide range of perspectives on current events in the region. The speaker series was co-sponsored by the Center for Jewish Studies, the Forum for Scholars and Publics, Humanities Futures @ the Franklin Humanities Institute, and the Duke University Middle East Studies Center.